North East India – the part of our country that many of us didn't know much about because of the lack of information in our school syllabus and news outlets. Thankfully, today's generation has a lot more content about the North East in their curriculum than our generation did. Plus, there is the internet now. These days, whenever I meet new folks or go to social events, people ask me about the North East and they express their desire to visit the place. And I try my best to help them out in any way that I can. One of my old blog posts "Travelling to Mizoram: A tourist guide" has currently more than 10000 views so far, and I have been contacted by a lot of people regarding that post, including my former boss' dad! It was only after we spoke that we realized I was working in the same organization as his daughter, who was my copywriting boss back then, lolz, small world indeed. And one of my answers on Quora to the question What are the "things to remember" before I start off to travel in Northeast India? is currently the top-voted answer with more than 40k views. I try to be as proactive as possible in the online world. The sad thing about visiting the North East is that, there are not many travelogues to be read online. Yes, a few good articles are out there, about travelling wanderlusts who had flown to Mizoram and experienced our unique "tlawmngaihna" culture. But memories like that shouldn't be limited to just a few Facebook and Instagram updates or a blog post link that people will share for a short while before it fades to oblivion. No, the beautiful North East is more than that. If you want to truly discover the North East, backpack across the region! Get in touch with the locals living in far desolated hamlets and not just the urban gen-pop living in the capital cities. Admire the tranquil beauty of raw undisturbed nature and experience the diversity of North East India that many Indians consider to be just one entity. As Mark Twain once famously wrote, "Travel is fatal to prejudice, bigotry and narrow-mindedness, and many of our people need it sorely on these accounts", when you backpack across the Northeastern region, you will not just see but experience how different we Northeasterners are from each other, be it our language or traditional customs. And this is why I wanna give a big shout out to Abhijeet and Navita Deshpande. They not only run a popular web portal Backpacking Series filled with travel content on how to backpack across the North East and other useful advice, they actually DID backpack across the North East themselves! 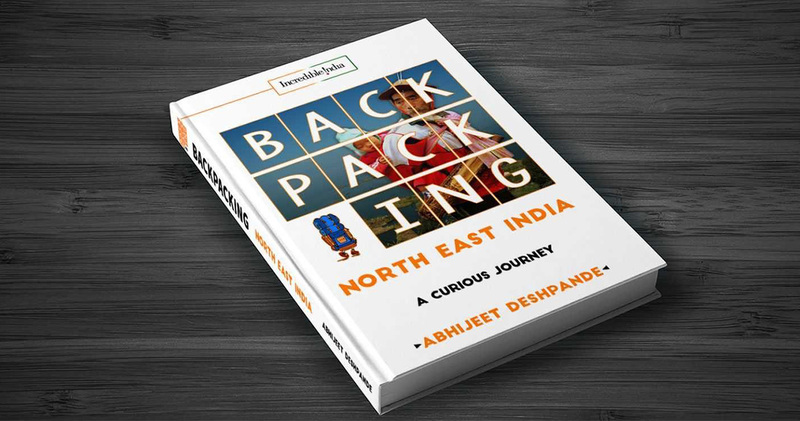 They have published their backpacking experience across the North East and it is available at Amazon and a couple of other e-com sites like Flipkart, Google PlayStore, Apple iTunes, Infibeam etc. The Paperback version costs ₹ 449 while the Kindle version is available at ₹ 131. Now, I was one of the lucky ones to receive a free copy of the book from Abhijeet because he wanted to know my opinion about the content. One of the perks of being a blogger I guess, lolz. Well, I have read the book and I simply love it! Everything is narrated so well, right from the start of their journey with their personal first-hand experience on the ground to planning for their next destination. Even though I am from the North East, there were many places they had gone to that I had never been before, and it made me want to re-discover my neighboring states as well. Regarding the section from the book about Mizoram, there were a few spelling errors on some local places, words and names, but that is fine, as the book is not written by a localite. Such minor errors make the journal even more authentic. But if I was to give my critique, then I guess it would be the fact that Abhijeet didn't talk about his experience of getting an ILP (Inner Line Permit) to enter Mizoram. Even though he mentioned about the ILP a couple of times and where one can get it from, it would be very helpful for aspiring backpackers to know what is the exact process of getting an ILP, whom to approach etc. to make it an even more descriptive first-person narrative. By the way, I am so jealous of Abhijeet and Navita because they had even gone to Rih Dil, considered as "the biggest lake in Mizoram, which lies in Burma" :) Yeah one has to actually cross the Indo-Myanmar international border to go to this lake, which plays a pivotal role in our Mizo folklore. I've always wanted to go there, and they beat me to it. Rih Dil is on the top of my bucket-list, and it is my dream wedding destination. My idea of a perfect wedding day is not in a Church in the heart of Aizawl but on the banks of Rih Dil, surrounded by loved ones and close friends, where the beautiful bride walks towards me under the willow by the lake as YZTP band plays a cover of Tim McGraw's "My best friend", while cousin Hriatpuia is probably passed out at a nearby boat on the lake from drinking Burmese beer one too many! Anyhoo, I'm digressing a bit here. Coming back to the book, I really recommend you get it. And you can even get a free copy if you write about your experience on visiting the North East and post that at their website. For more details on that, visit this link. So do get this book, for all of you who are eager to explore the North East, and this is not limited to just people from outside the North East. There are a lot of interesting tales from other Northeastern states in this book, which I'm sure you would love to experience even as a Northeasterner. This book will also give you an idea on how much budget you'll have to spend, as Abhijeet and Navita mentioned their expenditure at every location. Do let me know know if any of you are partaking on this. It's gonna be a lot of fun. Cheers!